You often hear about renewable energy success stories in cities in the developed world – places like Vancouver, which has committed to get 100 percent of its energy from renewable sources before 2050, or San Diego, which has promised to obtain 100 percent renewable electricity by 2035. Many initiatives exist to promote 100 percent renewable energy in these places, such as the Renewable Cities program at Simon Frasier University in Canada. But while much attention goes to the global north, cities in the global south are also poised to scale up their use of renewables, such as wind and solar. The cost of renewable energy has declined precipitously. Between 2009 and 2014, the cost of solar photovoltaic (PV) modules declined by 75 percent, while the cost of wind turbines dropped by 33 percent. Furthermore, the cost of residential solar PV has been declining significantly in recent years: in 2015, it was competitive with natural gas generation in India and nearly so in China. Battery storage is also becoming less expensive, which will make distributed energy even more affordable. Between 2008 and 2014, battery costs have declined 20 percent each year. Many cities in the global south have made robust commitments to tackle climate change. For example, many of the hundreds of cities that have signed on to the Compact of Mayors, a pledge to reduce greenhouse gas emissions in urban areas, are in the global south. Palawan, Philippines; the Maldives; and Uganda’s Kasese District have all announced 100 percent renewable energy goals. Regulatory policies, such as feed-in tariffs (long-term contracts to renewable energy producers, offering a fixed price) and net metering (a billing mechanism that credits renewable energy system owners for the electricity they add to the grid), have spread beyond Europe and North America to municipalities in developing countries. Distributed renewables allow cities to make progress toward their climate goals and take more ownership over their electricity supply. And there is a realization that distributed renewables in cities can help countries fulfill two Sustainable Development Goals, one on ensuring modern energy access to all (Goal 7) and one on creating cities that are inclusive, safe, resilient and sustainable (Goal 11). While some are only in their nascent stages, there are a plethora of new finance and business models for distributed renewables. For example, pay-as-you-go (PAYG) programs, where companies rent solar home systems to consumers, who pay a small monthly fee often via their mobile phones, have taken off in parts of sub-Saharan Africa. In less than one year, the number of households using PAYG systems in the region doubled to between 450,000 and 500,000 in 2015. 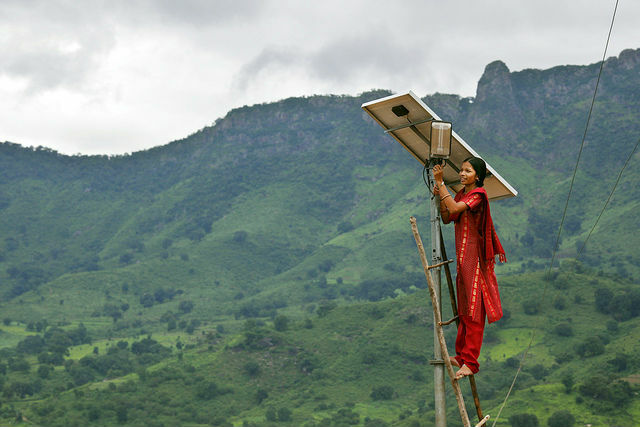 Net metering, enacted for example in Cape Town, South Africa, and many states in India, has allowed households to not only be consumers of electricity, but prosumers, where they actually produce so much renewable power that they can meet their energy needs and sell the excess back to the grid. In Delhi, there is a roof rental model where homeowners can lease their roof space to solar project developers. Community-shared solar, which allows multiple individuals, many of whom may lack financial capacity or available on-site resources, to pool their resources to purchase PV systems, is gaining interest in urban areas of the global south. Michael Westphal is a Senior Associate on the sustainable finance team at WRI.